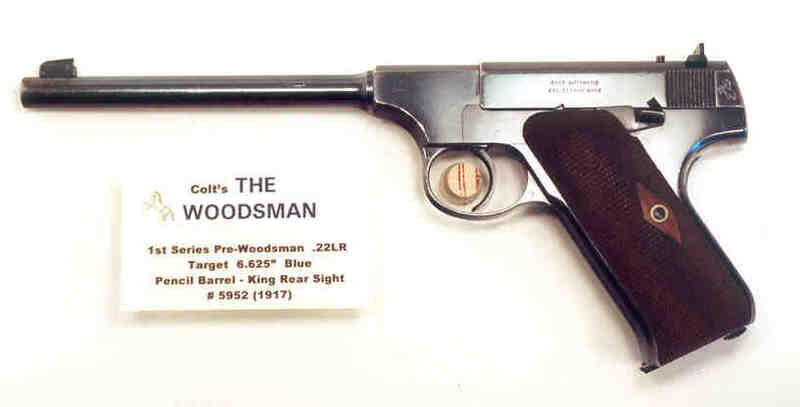 Pre-Woodsman 1st Series Target .22LR 6.5" Blue, 98%, SN#5952 (1917) pencil barrel model with correct beautiful original diamond escutcheon walnut grips in quite excellent condition, correct early 1903 barrel patent date, correct early mainspring housing for regular speed ammo, correct early two-tone magazine w/brass follower, correct adjustable bead front sight, King rear sight w/round white outline, mint bore, no box or papers (can furnish Xerox copy of 1st Series gun Instructions). Gun has some very minor scratches but presents very nicely with very minimal muzzle wear. All markings correct. Exceptional 83 year-old gun!